Home Yoga Is your yoga teacher right for you? Deciphering whether your yoga teacher is helping you or holding you back can be a tricky process, so we’ve listed some questions to ask yourself to help you start. 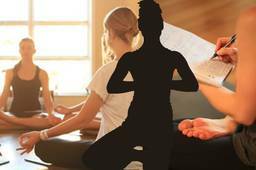 Is your yoga teacher helping or hindering you? As with anything, choosing the right yoga teacher for you is pivotal to success and growth, both physically and mentally. If you cast your mind back to your days at school or university, you will remember that some teachers or professors struck a chord with you and made learning enjoyable and easy, while others didn’t quite have the teaching methods you needed to match your learning style. The same goes for any area of interest or skill you aim to learn and progress in, and yoga is no exception. So just how do you know whether your current teacher is helping or hindering you and, if so, how do you go about finding one to match your preferred yoga instruction vibe? Is my yoga teacher helping me progress or holding me back? Sometimes a yoga teacher just gets you, and vice versa, but sometimes it can be difficult to discern between your super-enthusiastic yoga classmates raving about a particular teacher, and your own personal rapport with that teacher. When evaluating whether to stick with your current yoga instructor or not, it’s important to ask yourself some questions to delve into the best choice for you. ● Do I look forward to going to yoga classes? ● Do I feel like the instructor makes an effort to improve the posture and body alignment during the class? ● Is my teacher understanding and supportive of each individual's own strengths and weaknesses? ● Is my yoga teacher available before and after class for any questions students may have? ● Does my teacher praise hard work and progress? ● Do I leave yoga feeling calm, refreshed and inspired? If you answered “no” to more than one or two of these questions, it might be time to assess your options and consider switching up your yoga teacher. How do I go about finding a great yoga teacher? The best way to find the perfect yoga teacher for you is to commit to trying out various classes taught by different instructors. Enjoy the process of testing out a handful of different instructors, and you will be almost sure to find one that is the right fit for your own needs, goals, and yoga aspirations. For more information about how you can find the best yoga teacher for you, please contact the expert contributor for this article.